"Yoga helps kids find time between school and after-school activities that they can really be with themselves," Nicole Cardoza says. "We see it help with focus and attention during the school day, and it also helps them feel more confident and be more collaborative with their peers." Cardoza is the founder of Yoga Foster, a nonprofit started in 2011 that brings yoga to public schools through free teacher training, curriculum development and resources. 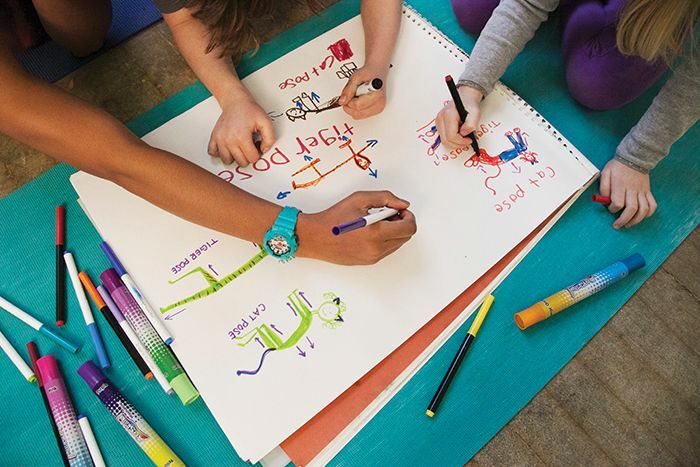 Their approach blends traditional yoga practices like breathing techniques and poses with enhancements that appeal to kids (think: Frozen-themed sequences, kid-friendly names for poses and post-class drawing sessions where students illustrate the stretches they've completed). Just as she hopes to teach kids about taking time to reflect and be in the moment, Cardoza says that she often needs to remind herself to stay present amid her hectic schedule juggling teacher training, private lessons and the pressures of running a nonprofit. "I'm always making sure to schedule a few minutes where I can stop and breathe and have my own moment," she says. "Time is everything, and my Baby-G watch helps me stay on schedule." Nearly as important, Cardoza says, is her Baby-G's versatility. "In the office I wear a lot of neutrals and I like that my Baby-G can be a statement piece," she explains. "When I teach yoga, I always wear bright colors and crazy patterned leggings, so I like that I can have a watch that really pops with the rest of my outfit." No surprise, her young students love it too.